There’s nothing like Southern cooking to get me drooling! This delicious Sausage and Potato Casserole Recipe is such a quick and easy meal that tastes so good, it’s hard to believe it’s only 5 Points! Full of cheesy goodness, and flavorful sausage, I loved the variety of textures and flavors in this dish. You can use everything frozen and just throw it all together in a few minutes, which is great if you are pressed for time. 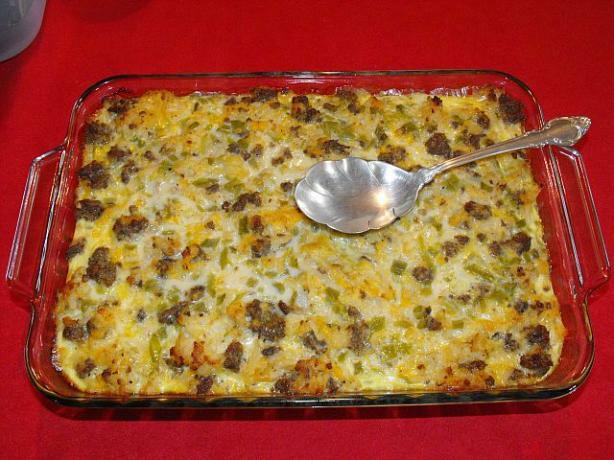 If you are a fan of the flavors of the South, then try this Potato and Sausage Casserole Recipe, asap!! Preheat oven to 350°F. Spray a square or rectangular baking dish with non fat cooking spray. Pour in the potatoes, corn, peppers and onion, then top with sausage. In a small bowl, beat together milk, garlic powder, egg substitute, salt and pepper; pour over sausage and then top with cheese. Bake until casserole is cooked through and cheese is browned, about 45 minutes or so. Evenly cut into 6 pieces. This looks DELISH! Any idea how many Flex points for this? I don’t see the nutritional info so I wasn’t sure how to convert it to Flex. This was really, really good. I had to improvise. I could not find reduced fat cheddar cheese, so I used reduced fat 4-cheese Italian blend shredded cheese. I used the Jimmy Dean reduced fat turkey sausage crumbles. My husband loved this recipe too. It’s a keeper. It was very easy to make. this is freaking DELISH. i eat it with a little Trader Joe’s Low Calorie Queso which has ZERO p.
This was delicious and reheated great for my lunch at school. I forgot to put the corn in. Mine, too, was a bit runny when I first cut into it…I couldn't wait for it to set. Gave a couple other teachers a bite and they want the recipe, too. Thanks again! I noticed that the ingredients called for 1 cup of corn but it was not mentioned in the making of the recipe. Should it be included or not? Also I didn't see where the question was answered regarding baking the casserole covered or not. All the recipes I've seen online look delicious and we intead to try the all!!! Thanks for your help. Thank you i will put down 10 and do my excercises…lol Keep up with the great recipes.. Boy i am having a hard time finding turkey sausage and lite cheese I did the points with regular cheese and mild sausage. I got a total of 12 plus points does that seem right to you? It's hard to say, and though the Points + value would definitely be higher, 12 Points Plus does sound a little high. Regular sausage and cheese will have a lot more fat, thus raising the Points + value pretty significantly. Made this and both my husband and I decided its a keeper! I would mix all ingredients together instead of pouring the egg mixture over the layered ingredients. I would also mix through half the cheese and tob with the other half. @Keller – I used potatoes found in the produce aisle that were hashbrown style. Maybe using the frozen (not thawed) is what made it watery? Thank you LaaLoosh for these great recipes and counting the points+!!! I made this with Turkey Brown and Serve sausage and it came out great! I made it just as posted and cooked it a little longer than it said to avoid being watery. It as a hit with the whole family! Is the saugage cooked before adding it to the casserole? It doesn't have to be. The baking will cook it. However, if you feel more comfortable, you can lightly brown it first in a skillet. I was so looking forward to this dish, but mine came out a liquidy mess. Not sure what I did wrong…the only thing I changed was to use fat free cheese instead of reduced fat…..don't think that would have done it. I'll give it another try soon and hope for better results. Update: We made this last night and it was really good. We made it using the MorningStar Farms Veggie Sausage crumbles. It was easy and quick to throw together too. We were out of egg substitute so we added one egg and one egg white. It came together well and we will certainly make it again. This would be good with other veggies added too. This looks really yummy! My husband is a vegetarian and I plan on making this using the MorningStar Farms Veggie 'Sausage' crumbles. This is a great substitute and they taste exactly like regular sausage. I also happen to have all the ingredients in my fridge at this very moment! :D Do you think you could tell me how using the veggie sausage will change the points+ value? Can you put the calories/total fat/fiber so we can figure out the totals using whichever system we use? Looks yummy! I'm putting it on the list for this week or next. May try it with yellow squash and/or zucchini instead of the corn. I was wondering if you had any ideas about what to serve with this? I am very excited to try this, but was looking for ideas to round out the meal. I just joined WW and have a lot of points. Also, I would like to thank you because this site is wonderful and really encouraging. I would suggest something light…like an arugula or spinach salad. Or some roasted asparagus with feta cheese. Or some steamed broccoli! Do you bake it with foil on top for part of the time or leave it completely uncovered the entire time? It's going into the oven tonight so I'll experiment. Can you let us know the points and the points plus values? For thoses of us who wish to keep going on the old points system. Since I now have all the materials for calculating Points Plus, I'm going to be posting that info only as opposed to Points also, because it's quite time consuming to do both. Eventually, the Points system will be entirely phased out, so I'd really encourage all of my readers to switch over to the new Points Plus program. I was really resistant at first, but it helps you eat better and make much healthier choices! Oh yum. Looks really good for just a few points! in stead of using fat free skim milk am i able to use unsweetened almond milk?